Take the "Default Value Editor" for example. This simple editor provides the means to define a default value for columns' cell values for the Guided Decision Table editor. When a new row is inserted the cell assumes it's default value. Simple. The Default Value Editor has always been a TextBox and it was time it was improved to be consistent with the new improved "typed" editors used through-out Guvnor (with CR1 looming more extensive enhancements take a back seat). 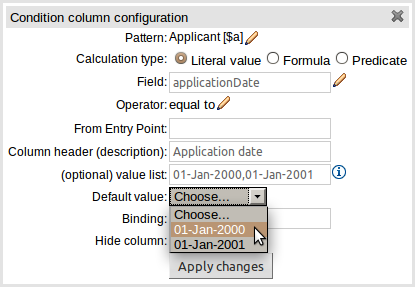 The requirement was simple: make the editor suitable for the data-type of the column. If the column field is a "dependent enumeration" the default value must be one of the permitted values based upon parent enumeration default values, if any. Default values are not required for Limited Entry tables. Default values always remain optional. Default values can be defined in either the Guided Decision Table editor or the Guided Decision Table Wizard. The changes are now complete and committed to github in time for the CR1 branch. If you use decision tables, if you use default values be sure to check it out before Final. What started as a quick enhancement before CR1 turned out to be more extensive than expected. We are pleased to announce Protege 3.5 alpha! The main focus of the 3.5 series is the SWRLTab's support of the Drools rule engine, thus providing a completely free and open source solution for executing SWRL rules in Protege-OWL. Please contact us via one of the Protege 3 mailing lists with questions, feedback, and bug reports. Download Protege 3.5 alpha from the main Protege website (new users, please register first). The contents of the release notes section describe changes relative to Protege 3.4.8. The SWRLTab now supports the Drools rule engine. A new tab called the SWRLDroolsTab provides a graphical interface for interacting with this implementation. The existing SWRLJessTab is still available. All existing SWRL built-in libraries are supported in the Drools implementation. Both the Drools and Jess implementations now use a pair of OWL 2 RL-based reasoners for performing inference (read more). These reasoners are also used by the SQWRL query language. The Java APIs provided by the SWRLTab have changed slightly so users of these APIs will need to update their code. Information on these changes can be found here. The process of building the SWRLTab and its associated rule engines has also changed. The new build process is outlined here. To be honest, numerical data-types in Guvnor have not been supported that well in the past. The best you'd get, to edit such values, was a text box that had very limited restriction on what could be entered. This was largely because the heart of Guvnor used to drive most of the editors was only aware of a generic "numerical" type. With a little bit of blood, sweat and tears this has now been improved to differentiate between all of Java's primitive numerical types (byte, short, integer, long, double and float) together with BigDecimal and BigInteger. When adding a numerical field to a rule you now get an editor relevant for the type with more strict validation. DRL generation has subsequently been improved to ensure the distinction between numerical sub-types is rendered correctly (most notably the treatment of BigDecimal and BigInteger in the right-hand-side of a rule for Java or MVEL dialects). Dependent enumerations are now available to the Web Guided Decision Table editor in Guvnor. A dependent enumeration is one whose values depend upon the value of another (parent) enumeration. Examples include Continent\Country\Region, Manufacturer\Product etc. 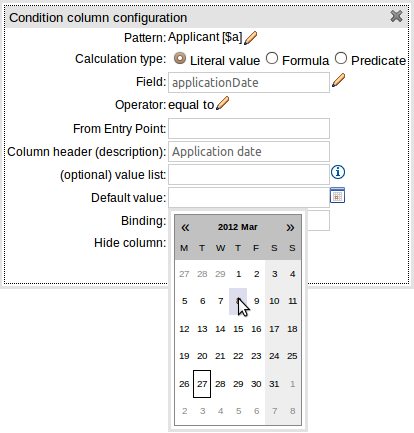 Dependent enumerations are available to both Extended Entry and Limited Entry tables; together with appropriate expansion when generating an expanded form table. Dependent enumerations also function in the BRL Rule Editor and Rule Templates. For those wanting to see dependent enumerations in action and can't wait for CR1 here's a quick video demonstrating them: The dependent enumerations are shown first, then a new expanded form decision table is generated before being edited. A couple of regressions were noticed by a vigilant community user (thanks Nicolas Héron) and have been subsequently fixed. The changes for both enhancements have been extensive hence I would urge you to download and try CR1, when it becomes available, so anything else untoward can be squashed before 5.4.0.Final. 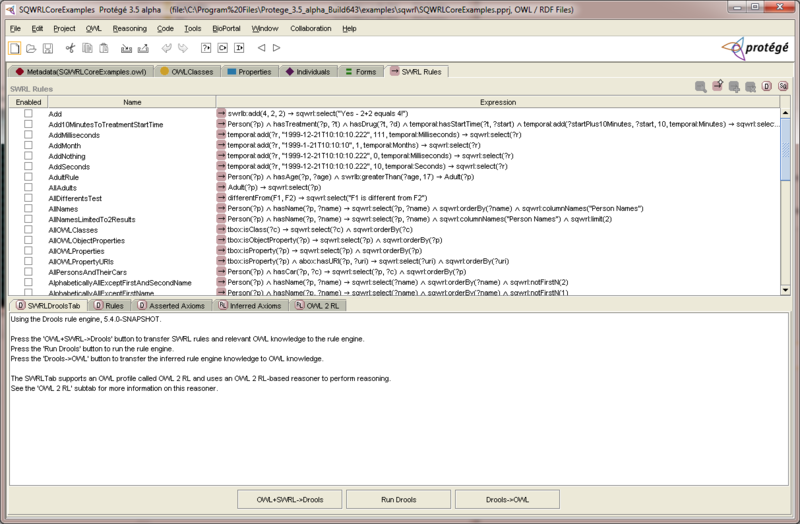 We are close to releasing a new version of the jBPM Web Designer. This version will include awesome new features and numerous bug fixes - read all about it here! 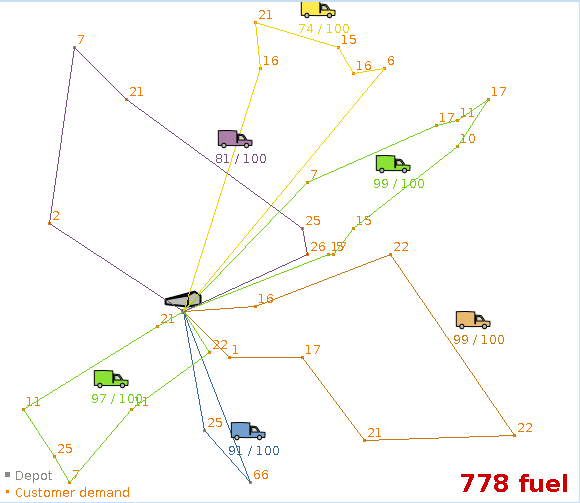 What's the optimal way to supply all locations with their request items, using 6 vehicles with a capacity of 100 items each?